Despite the sagging economy, 2009 was a pretty good year for facial cosmetic surgery. In its most recent annual membership survey, the American Academy of Facial Plastic and Reconstructive Surgery (AAFPRS) reports that the overall number of procedures for the year was up 47 percent from 2008, driven mainly by a 79 percent increase in cosmetic non-surgical procedures. Cosmetic and reconstructive surgical procedures also showed gains, up 13 percent and 31 percent respectively, while revision procedures declined by 14 percent, the new survey shows. On average, AAFPRS member surgeons each performed 1,076 facial cosmetic surgical, cosmetic non-surgical, reconstructive and revision procedures in 2009; almost two-thirds of those procedures were cosmetic and non-surgical. 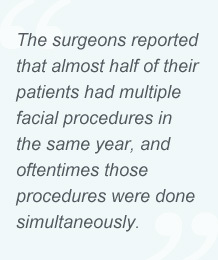 The surgeons reported that almost half of their patients had multiple facial procedures in the same year, and oftentimes those procedures were done simultaneously. More people are pursuing cosmetic surgery to remain competitive in the workplace, according to some of the surgeons polled. Other trends include more educated and informed consumers and an ever-increasing appetite for non-surgical procedures such as Dysport or other injectables to delay the more expensive, complicated surgeries. As for the future of facial plastic surgery, three-quarters of the surgeons predicted further increases in ethnic plastic surgery and that more surgeons will offer wellness and lifestyle services. The vast majority (84 percent) of people undergoing facial cosmetic procedures in 2009 were women. Their most common cosmetic facial plastic surgery procedures were facelifts, blepharoplasty (eyelid surgery), ablative skin resurfacing, and rhinoplasty (nose surgery). Minimally-invasive Botox, hyaluronic acid injections, chemical peels and microdermabrasion were the most common non-surgical cosmetic procedures among both men and women. Demographically, Caucasians made up the majority of cosmetic surgical patients (80 percent), with the remainder split equally between Hispanics (7 percent), Asian Americans (6 percent) and African Americans (6 percent). African Americans and Hispanics were most likely to undergo rhinoplasty, while Asian Americans opted most often for blepharoplasty or rhinoplasty. The top procedures among Caucasians were facelifts, blepharoplasty and rhinoplasty. The AAFPRS report also reveals that more than half of all procedures performed in 2009 took place in a surgeon's private office. Procedures done in hospitals and free-standing surgical centers accounted for 44 percent of the total, and just 2 percent were performed at medical spas. On the subject of safety — always a concern with any surgical procedure — 31 percent of the responding facial surgeons said they were aware of problems with patient safety or the practice of medicine without a medical license in their own state. Fifty-two percent indicated that they knew of misleading advertising involving injectables, lasers or other cosmetic therapies. The data for this study was collected directly by AAFPRS from its members on the Web in January and February 2010 using a website for conducting self-designed Web surveys. With over 2,700 members, AAFPRS is the world's largest association of facial plastic and reconstructive surgeons whose focus is on the face, head and neck. Academy fellows and members are board certified and subscribe to a code of ethics.